I was absolutely mad for Moroccanoil when it arrived on the scene a couple of years ago, it really was the perfect product for my ever-so-slightly –tortured hair at the time and the best multitasker I’d met in a while. Since then more than a few pretenders have made their way onto the shelves, and the Moroccanoil range has answered this with serious expansion into a collection of amazing products. 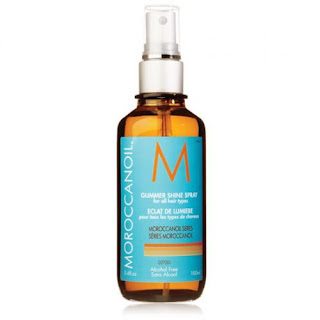 The one I’d like to sing the praises of today is Moroccanoil Glimmer Shine Spray, which is essentially an invisible veil of pure luminous shine and will be a perfect product choice in light of the humid months to come. For hundreds of years Argan oil has been used by women in Morocco to treat hair and nails in order to counteract the effects of the hot climate, and this baby contains that and more. It infuses hair with a pretty veil of shine, enhances colour and highlights and prevents hair static, all without weighing the hair down. It also contains UV filters and protects the hair against harmful pollutants. 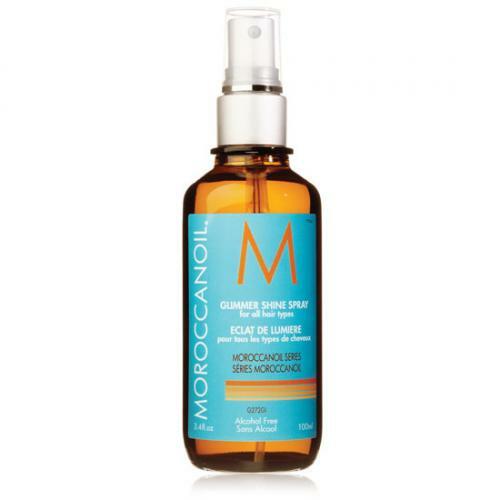 Lastly, it comes in an amber bottle similar to the original Moroccanoil, which protects it from oxidation and degradation. The directions on the box say to spray it “in a misting motion” from a distance of 10-12 inches, but I prefer to squirt on my hands and lightly rub over my hair so I can control the amount used a little more due to my oily roots.